"Everybody's Asian," I thought, shopping last week at Costco. The notion came out of nowhere, and I looked at it, as if somebody had lain an unfamiliar coin in my open palm. There is a certain inherent racism in such a thought: we aren't supposed to notice such differences. Though we all do. We've trained ourselves not to remark upon such thoughts; it's safer that way. Nobody can complain about something you didn't say. But I feel comfortable ... well, maybe not comfortable ... I believe that sharing the thought is not blatant folly because it wasn't followed by any kind of negative imperative. It wasn't "Everybody's Asian, so I 'm not coming back here," or "Everybody's Asian, and they're eating up all the coconut shrimp like Asian people do." I don't harbor negative stereotypes, that I know of; I have Asian friends, relatives. They have the same good qualities and flaws that everyone else has. Still, there the thought was: "Everybody's Asian." Instead of pushing the thought away, I tried to pick it apart, understand what it meant. Maybe because the status of Asian-Americans is in the news due to the Harvard lawsuit—Asian students alleged that they were the victims of quotas, that standards are lowered for non-Asians so that the university wouldn't have a percentage of Asian students high enough to spark discomfort. The sort of systemic bias that Jews faced in the 1920s and 1930s. Maybe Harvard looked around and had the same thought I did at Costco. That's reassuring. At least it isn't just me. Noticing the presence of others who are different than oneself is a sign of mild discomfort. 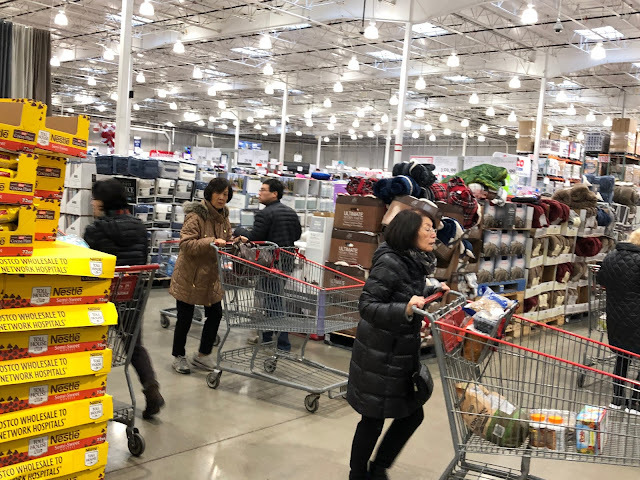 I might expect my suburb to be a certain mix, and if that mixes shifts—the Asian population of the Northwest suburbs is growing faster than other ethnic groups—you notice. Discomfort being how dominant races feel when they find themselves in the minority. Not that I felt discomfort. It felt like a neutral observation, maybe salted with muted surprise. In certain settings it wouldn't be remarkable. If I were, oh, at the Super H, an Asian market in Niles, I wouldn't think, "A lot of Asians here." It would be expected. As it would be in Japan, or China, or Taiwan, or the other Asian countries I've visited. So perhaps because I was in the Costco in Northbrook. No different than finding regular-sized packages for sale. Nor that I consider myself the member of a dominant race. As a Jew, we're by definition in an extreme, despised minority, though our minority card seems to be revoked. We're the minority that other minorities feel free to hate, or lump together with white Christians, as circumstances dictate. The worst of both worlds; all the drawbacks of being a minority but none of the benefits. That isn't true either. Benefits aplenty. See, this is why people don't write about these issues. So easy to slide into the ditch. At checkout, I looked around, tried to put a number on that thought. Was "everybody" really Asian? No, not even a quarter. Enough that it would register on my radar. So the thought was something bogus, unvalid. A glitch in the system. Which is what makes this exercise worthwhile. We can't recognize our errors if we never examine them. The whole subject is generally avoided. We yield the issue to the people most concerned, supposedly. But that too is a kind of racism. It is of concern to us all. Silence is too easy. Which one did you go to, Glenview? If you really want to see a variety of people, go to the Niles Costco. or the Lincoln Park Costco on Clybourn. Clybourn is great fun to go to & have a hot dog & watch the rich people push their carts out the store with thousands of bucks of stuff in them. A few times I've seen people with three carts! Even more fun is to watch them go nuts over free samples of food. You'd think they haven't eaten in weeks by their behavior! tho i've never seen her, apparently Oprah occasionally stops by (or at least used to when she still lived here). i have, however, seen Jason Beghe of Chicago P.D. and Ozzie Guillén there. people who practice judaism are a religious minority. in America their rights are protected along with everyone else who chooses to practice a faith. thats a choice. asian people the very term being prejudicial much like calling someone African ,what with the rich ethnic and religious as well as "racial" diversity present on both continents don't posses that choice. jews are as you are quite aware often members of many different ethnic minorities as well as members of other "races" but as far as it goes they , at least in America are mainly" white". this makes many jews part of the majority. many times its not possible to tell a jewish person from a lutheran, so while despised by some I would like to think at the very least, not a majority of people. ethnic and religious jews don't appear to us old white guys immediately optically different the way blacks, asians, most hispanics, native Americans and women do. thus the lack of "benefits" other minorities sometimes receive aren't granted to jewish people much like bahais, Zoroastrians , pagans, universal unitarians, etc. of course we all see the differences in skin color fairly easily and mistakenly ascribe many stereotypical characteristics to these strangers both positive and negative. its a learned behavior reinforced in many ways by our family members, the Media , literature, art, music, the government, churches and schools . I appreciate your thoughts and views on this topic, I hope as the great mingling continues and we become grayer over the next centuries this is a greatly diminished circumstance and we become more like the dr.bronners bottle implores: all one, all one. I understand that judaism and christianity are cultural and can be seen as a heritage as well. but our identities are very different from asians and other others who can't escape their unwhiteness and our reactions to that. I honestly don't mean to be rude, but I am curious: Why, among all the words in your comment, did you choose to capitalize only the ones you did? Thanks for the lecture FME. I make it a point not react to your misapprehensions of the world, but your last line, suggesting that Judaism is like a shirt a person can put on and cast off as circumstances dictate, is the typical underestimation of the situations other people find themselves in. Coey, I'm borderline illiterate and appreciate that my phone lets me talk and does the typing. It capitalizes things ,I almost never do. I try to proof it up a little bit. But when I go back and read it a lot of times I think oh my God that looks and sounds horrible. I don't mean to be rude either though mr. Steinberg certainly thinks that that's always my intention. I was raised a Christian in the Catholic tradition. I'm not Catholic that's a decision I made I'm not Christian. I don't practice any organized religious tradition. If the Catholics still claimed me I'd dispute that. I'm sure I'm wrong but it doesn't seem the same for a Jewish person. If their mother was Jewish they are Jewish. Right? no matter what they say or do they're just a non-practicing Jew. And if someone wants to become a Jew there are some Jews that don't feel like they truly are Jews. Right? It's not a shirt like Christianity. I understand that. I don't consider myself to be white either. I don't believe that there is such a thing as race. Just as many people now feel that gender is a fluid concept. I respect their opinion too. Neil lectures for a living. I respect that. I read the opinions of many writers in many different publications. I understand that the world isn't really the way I think it is. Everybody should realize that about themselves. Thank you for your response to me. It's much easier to read with standardized capitalization and punctuation. I find the lack of it jarring, and it slows down the flow of what you're expressing when I have to slow down and figure out where sentences begin and end. And I do try to read all the thoughts expressed here, time permitting! From the Christian, and particularly Catholic, point of view, Judaism has been considered a shirt one can cast off. Witness the "conversos" in 14th Century Spain and Portugal. In more modern times that became an issue when Italy's "race laws" made Jews second class citizens and worse. The Vatican went along initially on grounds that harassment of Jews was consistent with Catholic dogma but wanted Italian Jews who converted excused. Mussolini, by then under the thumb of Hitler, refused, insisting that once a Jew always a Jew. Neil is certainly right that one doesn't easily shuck the traditions one grows up in, even if you don't buy into all aspects. I consider myself a Christian, and would jump at the opportunity to attend a performance of Bach's B Minor Mass, but seldom otherwise see the inside of a church. Since the nuns taught us that we had accepted the Jewish Messiah, I always considered myself a member of a Jewish sect. Maybe growing up in Niles I never considered Jews as 'others', just different people like any neighbor. I also developed a strong affinity for dark haired jewesses, even after I learned that Anne Bancroft was actually Italian. But you are not alone, Neil, an uncle recently remarked to me that every show on WGN was about black people. Of course that week black-ish played in the same slot every night. Had he tuned in a little later he could have seen Tim Allen's show and seen someone who looked more like him and was, in real life and on the show, more in tune with his politics as well. Your snapshot atop this piece seems to confirm your observation, until you look at the blond woman barely in the frame along the right edge. Maybe you tried to edit her out but.... just kidding. At least you didn't use the O-word. In London some years ago I boarded with a Jewish family, and at one of their parties a chap asked me if I had been to a service where Rabbi so and so had spoken. When told I was neither a Jew nor a native Londoner but a Presbyterian from Chicago he said "Oh, that explains it. I could tell you were American, but you didn't seem to be one of those pushy New York Jews." Identity, and stereotyping, even within one's own community, can be complex. Jesus was, of course, a Jew, but, as Archie Bunker observed, only on his mother's side.